Microsoft's operating system Windows 10 ships with a -- growing -- number of system apps. Some apps have replaced programs like the Calculator that previous versions of Windows shipped with, others like Cortana offer new functionality that was not part of previous Windows versions. You had to go through a technical process up until now to remove system apps from a device running Windows 10. This involved running Powershell commands at first, but is now easier thanks to programs like Geek Uninstaller that provide you with an interface for that. Still, Microsoft did not provide a reason for blocking the uninstallation of system apps on devices running Windows 10. 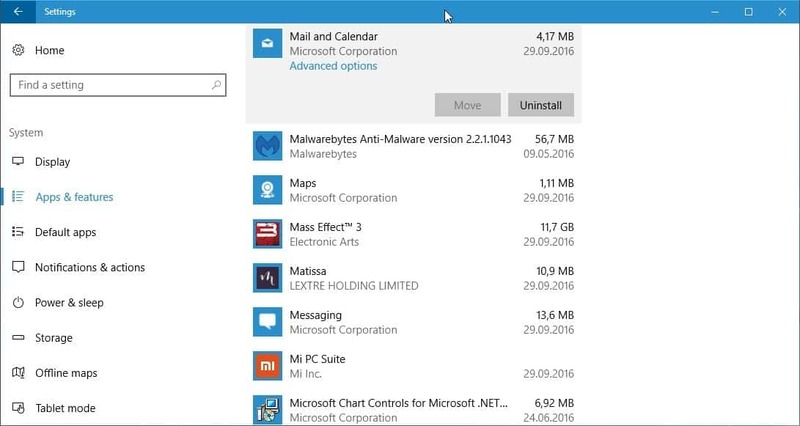 If you open the Apps & features section of the Settings application, you will notice that "uninstall" is not active when you click on system applications like Mail and Calendar. If you run the latest Insider preview version of Windows, build 14936, you may have noticed that Microsoft started to do away with the restriction on that build. If you open the Mail and Calendar application for instance, you will notice that the uninstall button is active now. This means that you can remove the system app from the machine without having to resort to Powershell or third-party programs to do so. Users who are on the stable version of Windows 10 cannot uninstall system apps using the apps & features menu currently. It seems likely that Microsoft will introduce the feature with the next feature update, codename Redstone 2, which will be out in 2017. Before you start jumping up and down in joy, note that some system applications cannot be removed. While you can uninstall Mail and Calendar, Calculator, Groove Music, Maps, and Weather, you cannot remove Alarm & Clock, Camera, Cortana, Messaging, and others. It is unclear why that distinction is being made. One possible explanation is that at least some of the system apps that you cannot uninstall using the Apps & features settings page are used for core functionality of Windows 10. Another possibility is that Microsoft is still working on the feature. Considering that it is only available in preview releases of Windows 10, there is a chance that uninstall will be activated for other system apps further down the line in development. Now You: Do you (or would you) use any system apps that ship with Windows 10? The latest Windows 10 Insider Preview build, version 14936, ships with options to uninstall the majority of system apps from the device. W10 is only stage one of the Microborg Collective’s global private data assimilation mission. What an truly insidius organization they are. If you listen to them, resistance is futile, unless you run Linux of course :). Been running Linux (Manjaro) for the last 4 months and am really angry at myself I didn’t make the switch earlier. What a joy it is to use, and KDE has been an utter revelation, head and shoulders above the Windoze GUI experience. Haven’t booted into Windoze for more than 3 months, probably going to nuke that partition before the end of the year. Can recommend it highly enough. Calling Windows “Windoze” is a tired old stunt that takes away from the credibility of your comment. Otherwise, I would agree with you. Picky, Picky !! Did you get out of bed grumpy or is it the norm for you ??? You troll buck then decide very graciously that his comment has merit and that you agree with him. Make up your mind. Windoze bothers you, but Microborg Collective doesn’t? Nonetheless, I’ve migrated to Manjaro KDE Linux, it is a joy to use, and I highly recommend it purely based on function, nevermind the blatantly obvious privacy benefits. Uninstall? More like delete a shortcut. Your speculation about apps being core or peripheral (only the latter being uninstallable) is probably correct. I don’t have Insider Edition so can’t test it. Makes sense, though. If you use some other mail/calendar application (like Thunderbird), for instance, why keep the MS app around? The other apps you mention as uninstallable are similar – they serve some peripheral function for which alternatives are commonly available. I don’t see Cortana ever being uninstallable. Cortana appearis to be integrated with the core Search function in Win10. Camera is needed a part of Hello, among other things. Alarm & Clock … you don’t want the computer to tell you what time it is (which has been in Windows since 3.x)? I’ve uninstalled the Alarm & Clock app and the Windows system tray clock still tells me the time. Don’t need an app for that. You can use Classic Shell to uninstall the apps. Just right click any app and choose Uninstall. It works for Alarms & Clock, Camera, Messaging also. Also if you use the tools/scripts provided by Sergey Tkachenko on Winaero, you can also uninstall Cortana, Edge, Connect, Windows Feedback and Contact Support. This new Win 10 update required new version of Xerox scanner drivers to be installed, what worked with the previous version now will not work. I’ve been able to uninstall these apps pretty much since Windows 10 was in beta. Just now I’m in build 14926 and I can do that. I don’t think they ever restricted this.